My very first planted set up that has been successful. It has aged just over 3 yrs. As of now I am battling nitrate issues with this tank so doing 60% water changes twice a week seems to work out a bit. Gravel vaccuming helps. Photo period is about 8 hours. Tank is relatively algae free except for the occasional blooms of green spot algae that I manually remove. I do dose seachem flourish sporadically and potassium when I see signs of deficiency. This tank serves as the main breeder for my group of panda cories. I did have hundreds of cherry shrimp. Started out with super reds and then made the mistake of adding dream blues and not so surprisingly ended up with lots of undesirable colour forms. Now left with few blue dreams that I transferred to the fry growout tank and the reds have been slowly exterminated by my angel. 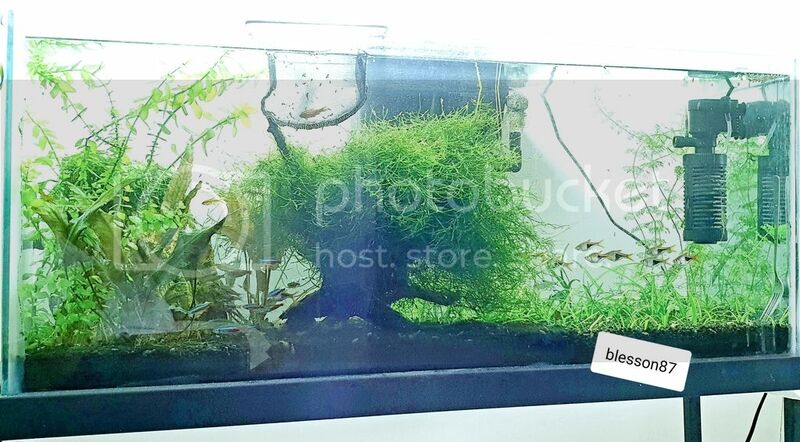 So future plans are to re home the angel and the lone cherry barb and probably restock on some neo caridina sp. of shrimp. Feeding wise tank gets fed once a day and the food is rotated between tetra bits, freeze dried tubifex worms and Repashy soilent green. I would love to start supplementing with co2 but my diy tries have failed miserably in the past and now hope to try co2 injection some time in the future. This tank has gone through so many livestock changes and now is stable with the present inhabitants. It also withstood the hardship of being torn down and moved when we shifted our residence. So this has been my journey with this tank. Feel free to add advice if u so wish. I would suggest just one thing about your setup: A reflector like this. You can get shades like this for ?50-?100 a piece at many electrical stores. Get a large reflector and you will find you will waste a lot less light and it will improve the overall aesthetics by a large margin since all of the light will now be focused downwards. Thanks ashwin. I did have a reflector on prior to moving the tank but silly me lost it during the move. But good advice. Will look into getting one more. You think i should continue with this or go on to co2 supplementation? As it is the plants are getting pruned every once in 2 weeks. But co2 will mean i can play around with more hard to keep plants? Your thoughts? Nice and simple setup thanks for sharing . Best pic I could take.